What is decidual bleeding during pregnancy? What does it look like and how long does it last? In the first trimester of your pregnancy, you may have some bleeding which is quite similar to a period. This is referred to as decidual bleeding and is quite common in pregnant women. What is decidual bleeding during pregnancy? Can you have a period while still pregnant? Decidual blood is the period-like bleeding you will experience in the first trimester of your pregnancy. At this time, the pregnancy is still in its early developmental stages with the placenta and the wall of the uterus not yet be fully merged as it should be for the rest of the pregnancy. Thus, parts of the uterus would be shed due to the changes in the hormones. 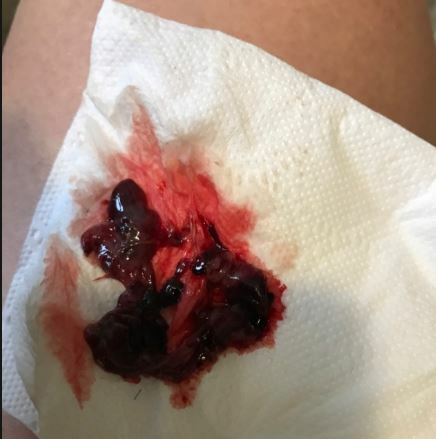 The reason this bleeding is similar to a period is because both are as a result of the shedding of the uterine lining. This bleeding may occur in the first trimester of your pregnancy and at times in the second trimester. You should be careful when it comes to any form of bleeding during your pregnancy. While spotting and the general amounts of discharge increase during pregnancy, bleeding in particular should be kept in check since it can be anything from decidual bleeding, chemical pregnancy, miscarriage and many others. Always check with your doctor each time you see an unfamiliar discharge in your pregnancy. The color of the bleeding is very much like a period. You will see a pink to light brown color in the discharge to know it is decidual blood. These colors show you that the blood would not be fresh as it takes a while for the blood to travel from the uterus to the outside. It will not be literally red blood as it is not fresh bleeding. Fresh bleeding will signal a problem with your pregnancy such as a miscarriage or a chemical pregnancy. Here are pictures to help you understand better. When the hormones that maintain the pregnancy are out of order, the thickened wall of the uterus may be shed. This case is common in the early stages of the pregnancy before the placenta is fully attached to the uterine wall. The decidual bleeding in such a case would not be an issue since it will cease with time. This type of bleeding borrows its name from decidua which is a layer of cells in the inner side of the uterus or the epithelial tissue of the endometrium. A fortnight after conception, the bleeding you may see could be due to implantation rather than decidual blood. Implantation bleeding occurs when the fertilized egg burrows into the wall of the uterus where it will develop for the next nine months. You may or may not experience implantation spotting. However, when you see some spotting two weeks after conception, you will know that you are expectant. Implantation bleeding will last for a few hours and only on rare occasions can it go for over a day. Stress can also lead to changes in your hormones with the likely results being bleeding or spotting especially when the delicate lining of the endometrium is disturbed. Stress during your pregnancy is something you should avoid at all costs. Besides making it hard to provide the best conditions for your baby, stress can lead to dire consequences such as miscarriages and others. You should thus focus on taking good care of yourself during this period. Diabetes has various effects on the body which may make it quite a daunting task being pregnant. The reason for this is the close relationship between the hormones that maintain the pregnancy and those that determine the levels of sugar in the blood. Once in a while, these hormones will come into conflict leading to some spotting (light bleeding) during your pregnancy. You may also have some heavy bleeding. If you are diabetic, make it a priority to tell your doctor about it when you intend to have a child. This way, your doctor will know what to do to make your pregnancy a successful one. You may expect that the uterine lining would have thickened enough by the time you become pregnant. However, at times, the thickening can still go on even after the pregnancy has set in. In such a case, the conflicting hormones will lead to some spotting in the early stages of the pregnancy. You should thus have the pregnancy checked each time you see any form of blood or uncommon discharge. By an uncommon discharge it means any discharge that has an odor, itch or is accompanied by any other traits. It is not easy to tell decidual blood apart from the other types of bleeding. This is because it mostly occurs when the pregnancy has no yet settled and thus there is a lot going on. Any form of discharge or bleeding could mean anything other than decidual bleeding. Period-like discharge which has a color ranging from brown, dark brown to pink. If the cramps are too intense or the bleeding too much, urgently see a doctor. The duration for this type of bleeding is typically shorter than your period. Given that the average period is around four days long, decidual discharge should always last less than 4 days. If it goes beyond your average number of days of a period, it could be another issue altogether. This type of bleeding shares many traits with a normal period and you may easily confuse it with a period. What you need to know, however, is that having a period when you are pregnant is not easy. Even if it occurs, it would be different from the usual periods you have. The first similarity between the two is the color of the discharge. Both have a brown to slightly pink color. Both have cramps to differing degrees. The decidual blood takes a shorter time compared to a period. This is two to three days compared to an average of four days respectively. The amount of discharge in a period is much more than the decidual kind of bleeding. The cramps you may feel during a period will be more intense when compared to what you will experience in a decidual kind of bleeding. The decidual kind of bleeding will also be accompanied with the signs of pregnancy. On the other hand, a period will not have any of these signs. When you have this kind of bleeding, you should always let your doctor know since it occurs at a delicate time during pregnancy. 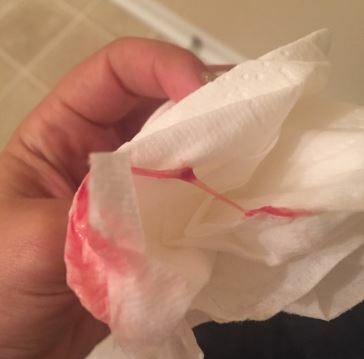 This type of bleeding has the same consistency with a period. It is heavier than normal blood and has some brown to black clots which make it heavy. Heavy blood flow with clots could mean a miscarriage. This means that, essentially, you will need sanitary pads or tampons for this kind of discharge. However, if the bleeding is a heavy flow with clots, you could be having a miscarriage. See a doctor as soon as possible. Implantation which is when the fertilized egg attaches itself to the walls of the uterus for growth. The bleeding and cramps for implantation are often very mild. The cramps could also be due to the growth and adjustment of the womb to accommodate the forming baby. This is quite common around the 12th week of your pregnancy when the ligaments which support your womb stretching to support the baby. You would normally feel sharp pain on the sides as you stand up from a sitting position. On its own, decidual bleeding will cause some cramps given that it involves the shedding of the walls of the uterus the same way it happens in a period. Shedding of uterine lining during pregnancy is possible. The signs of this occurrence are basically what you experience during a period. In the early stages of the pregnancy, the uterus and the placenta would not be fully merged. As the hormones change in response to the pregnancy, part of the uterine wall will be shed off in the same way a period happens. The reason you will have less of a discharge than during a normal period is because only a part of the uterine wall will be shed. This is because the hormone responsible for the thickening of the wall of the uterus will be increasing in amount to maintain the thickness during the pregnancy.